Your name in lights! A projected monogram is a fantastic way to add a personal touch to your wedding décor. Here's our monogram projector in action in the area under the balcony in Wenman's Barn at Caswell House, combined on this occasion with a multi-swag fairy light canopy. This space is ideal for a monogram as it's the way through from Bartlett's Barn (the reception area) to Wenman's, so it faces your guests as they enter for the wedding breakfast. The design of the monogram can be customised with various fonts, styles, names / initials, wedding date and optional flourishes. 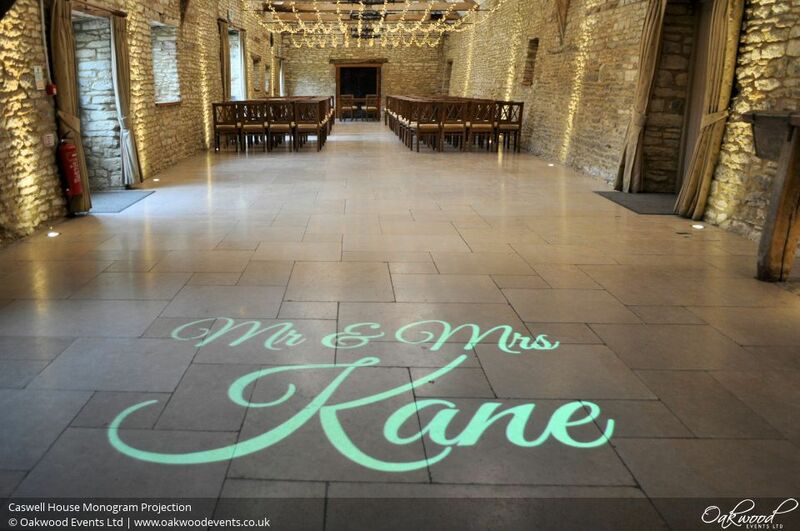 For lots more ideas, take a look at our main Caswell House lighting page, or get in touch with us here to discuss a projected monogram and other lighting options for your wedding at Caswell House.